So as i am typing this up we are currently on our way to manchester (where we are flying from). We decided to stay the night over close to the airport and then we would have to wake up so early in the morning in time for our flights. I Thought i would share with you guys something quite new here on my page and thats what i take with me on holiday. First off i have to say anyone who knows me will tell you i am one of those annoying people who just have to have things done in a certain way by a certain plan. 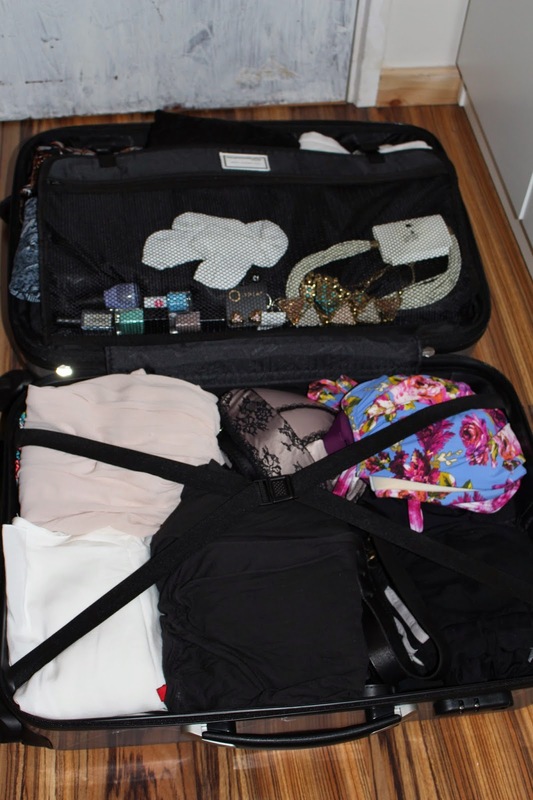 I like planning and when it comes to packing its no different for me. I treat it as a military operation and the first thing i do is list the different thing i want to wear or think of outfits. I then look in my wardrobe to see if i have the necessary clothes if not, i will make a trip to town and buy the things and then its time to organise the clothes in small piles. One of my pet peeves is a messy suitcase. I DNT know what it is about them but they and messy rooms just make me want to organise and clean. I dont really tend to take that many shoes (to me this is not too much and i know it might be for some of y'all) and as you can see i like to keep everything quite neutral as that way it means that i can wear and interchange my outfits easily. Wear we have to dress up for dinner most evening and so i decided to take my strappy heels as most of my outfits are quite basic as well and i think they will all work very well together. I then organise my bottoms and tops into black and white and some colours (yes navy blue counts as colour.lol) as well. This is the first time that i am going to be rocking shorts on holiday as i am not normally that comfortable with my dimpled legs but this time my attitude is SO WHAT!!. I just want to have fun relax and enjoy my time away to Dominican republic. Well you can see all the dresses that i am taking. Considering that we are going for just over a week i think i have packed really well and i have to say its all in the planning. Without my stupid lists i am sure that i would have probably missed one or two products but this way i just did a tick sheet for the items as they made their way into the suitcase. thank you hun. it was amazing!! !